The New Year is coming soon, and with it come two mass timber events you might want to mark your calendars to attend. The first is the Oregon Mass Timber Development Summit, scheduled for Jan. 15, 2019, at the Salem Convention Center. This one-day event is being presented by the TallWood Design Institute and Business Oregon, the state’s economic development agency. The summit is designed to help public officials, economic development folks, investors and manufacturers (or manufacturer wannabes) learn about multiple facets of the mass timber industry. Speakers will discuss tools, strategies and potential partners available to help support sector development for the use or production of mass timber and related products in Oregon counties and municipalities. I’m on the planning committee, so I’m privy to the content development for the event, and I can say with confidence this summit offers a lot in the way of learning about the mass timber sector. It will identify opportunities for entrepreneurs and investors to become a part of the sector. The topics are well-thought-out, and the speaker list represents a wealth of knowledge. If the topic of mass timber and how you might get involved intrigues you, I recommend you register before the spots run out. 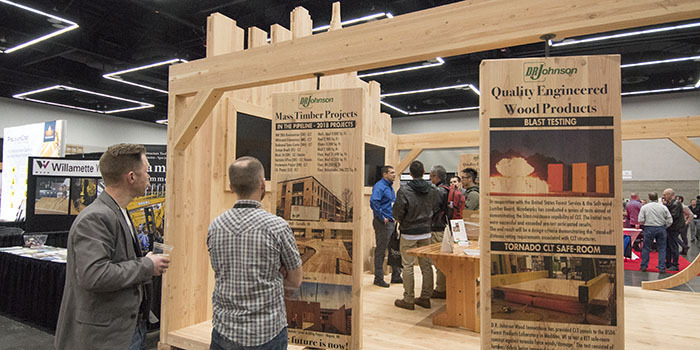 The date for the summit was strategically chosen because it falls about two months before the fourth annual International Mass Timber Conference comes to Portland on March 19-21 at the Oregon Convention Center. If the summit is the appetizer, the Mass Timber Conference is the entrée, the veggies, the sides, the wine, the dessert and the next day’s leftovers. OFRI is a co-sponsor and I’m on the steering committee, but even if we weren’t involved I’d be recommending this for anyone interested in learning about the current status of the mass timber movement. It is produced jointly by the Forest Business Network and WoodWorks, and the organizers expect at least 1,500 people (more than three times the number who attended the first Mass Timber Conference in 2016) to come to Portland for three jam-packed days of tours and presentations. Last year’s 800-plus attendees came from more than 20 countries, including as far away as Australia. With 20 concurrent panel discussions and three general sessions over two days, the conference will bring more than 80 mass timber experts from around the world to cover a wide range of topics. The conference steering committee is still putting the finishing touches on the various panels, but I can say that sessions will include deep dives into a number of important topics. These include the carbon story of mass timber, cost comparisons of wood buildings compared to concrete and steel construction, lessons learned on where maximum savings can be realized, and mass timber design and detailing. There will also be sessions addressing the latest information around fire safety, seismic and acoustics research, tall wood code changes, hybrid construction projects, mass timber supply chain insights, latest developments internationally, and much, much more. You should plan to attend – and make sure to come well-rested, because it can be an exhausting three days of nonstop learning and networking. Also, fair warning: The building tours typically sell out quickly, so if you plan to attend and you want in on a tour, you probably should register now. I look forward to seeing you at one or both of these premier mass timber events coming early next year. Until then, happy holidays. 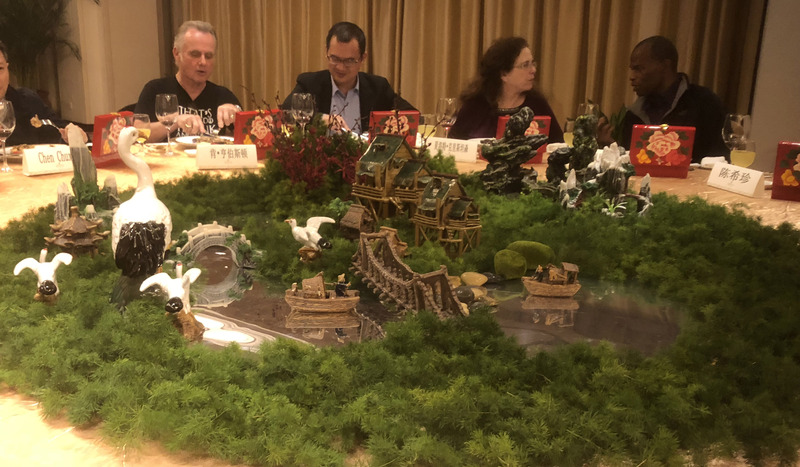 Earlier this month I had the distinct pleasure of representing OFRI on a trade mission to China led by the Oregon-China Sister State Relations Council (OCSSRC). The entire mission lasted three weeks, and I was able to join for about a week from Nov. 4-10. The target of the trade mission was Oregon’s Chinese sister province of Fujian. Fujian is in southeast China on the country’s Pacific Coast. Like Oregon, it has prominent mountain ranges (including the Wuyi Mountains), is dissected by a major river (the Min), is mostly forested and has strong agriculture, including dairy, rice and tea, and manufacturing sectors. A great fit as our sister state. The timing of the trade mission coincided with the China International Import Expo in Shanghai. At the expo there was an Oregon booth and a Softwood Export Council (SEC) booth. OFRI’s participation in the trade mission was covered by our membership in the SEC. I was not able to attend the expo due to my late arrival in China, but a million other people did. The expo is a huge symbol of the opening up of the Chinese economy to the world, and of the thirst their burgeoning middle class has for imported goods. The trade mission was led by Oregon State Rep. David Brock Smith from Port Orford, a strong supporter of active forest management to achieve healthy forests and a robust forest sector economy (he specifically requested OFRI’s participation in the mission), as well as Clackamas County Commissioner Ken Humberston, who is very interested in mass timber building and production. Other delegates included Dr. Jim Johnson of the OSU College of Forestry, a delegate from the Port of Portland, delegates representing Oregon tourism, and three delegates from the OCSSRC. 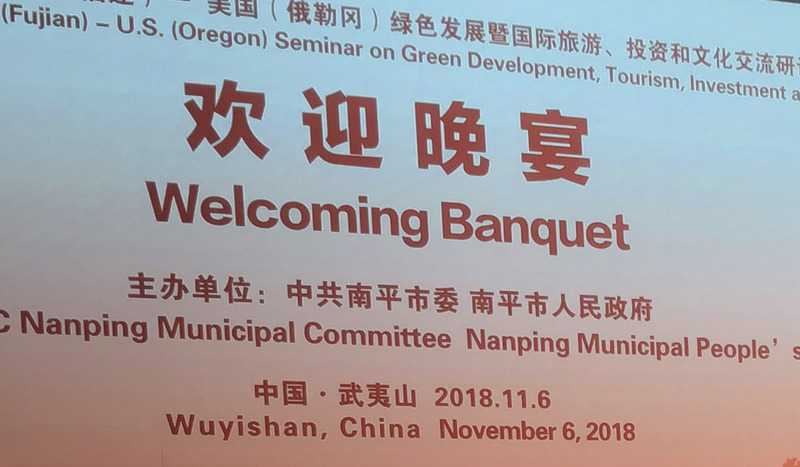 On my first full day in China, our group took a bullet train from Shanghai to Wuyishan city in the Nanping municipality of Fujian province, to attend the 9th China (Fujian) - U.S. (Oregon) Seminar on Green Development, Tourism, Investment and Culture. The seminar opened with a welcoming banquet. The food was incredible, and the atmosphere was warm and friendly. My five words of Mandarin, along with smiles and gestures, got me through simple introductions, but having some great translators really helped with communication. The Chinese treat their guests very well in general, but we were treated like royalty. There were several courses to the banquets, lots of toasts, and handing out business cards with two hands while smiling and bowing. I had my business card translated into Mandarin on one side as suggested by our OCSSRC leaders, and this really impressed our hosts, who generally have English on the reverse of their cards. It impressed them almost as much as my dexterity eating with chopsticks. They gave me an A for effort, but the servers usually brought me a fork and knife. Gift-giving is also part of Chinese culture at these events; I received several gifts of world-famous Wuyi black and jasmine tea. I gave away OFRI books and videos. All were happily received. The main meeting of the seminar was put together by the Foreign and Overseas Chinese Affairs Office of Nanping Municipal People’s Government. In addition to a general session with speeches by our Oregon delegation leaders and their Fujian counterparts, there were concurrent sessions on green development and tourism. A Mandarin-language version of OFRI’s Forest to Frame video was shown in the general session, and all in attendance were well impressed. Jim Johnson and I both gave presentations during the green development session. My presentation was titled “Oregon’s Sustainable Forests” and included discussion of timber types and ownership, timber harvest by owner group, forest protection laws and mass timber. The Chinese Foreign Affairs Office had my PowerPoint translated into Mandarin along with my English words. It was really cool to hear the translator repeat my words in Mandarin. One of the high points for me was Jim Johnson and I being interviewed by Nanping City TV after the conclusion of the seminar. The leaders of Fujian province are interested in building with mass timber – or at least interested in talking about it. They are very focused on green development and see using wood in construction as part of that. And, from what I observed, there’s certainly a lot of construction going on in the region. We saw an incredible number of apartment buildings going up. Some were more than 50 stories tall, while many are 20-plus stories. We literally saw hundreds of construction cranes in five days. But all the new buildings I saw appeared to be built out of concrete, brick and steel. If just 1 percent of these were built of mass timber, it could take a lot of wood. After a visit to Wuyishan Mountain Park, the sister park of Crater Lake National Park, and a ride down the Min River on bamboo rafts, we headed by bullet train to Fuzhou, the capital city of Fujian province. In Fuzhou, we had a seminar and news conference with Fujian Provincial United Chamber of Commerce, where we learned about the province from the business leaders. The high point of this day was the signing of a memorandum of understanding between the governments of Oregon and Fujian. Forestry is an interesting enterprise in Fujian province. The landscape of Fujian is steep and dissected, and mostly covered with trees. It reminds me of the Oregon Coast Range. Most of the native forest in Fujian province and much of China has been logged over the last millennia or so, with reforestation being a concept that only got going about 30 years ago. Most of the forests are therefore young. They are mostly owned by the government. Logging is generally prohibited, and forest management consists mainly of tree planting. Major tree species that have been planted include sugi (Cryptomeria japonica),which resembles Pacific yew in leaf shape but Douglas-fir in growth and tree form, dawn redwood (Metasequoia sp. ), an ancient deciduous relative of California redwood that has golden leaves at this time of year, and Chinese red pine (Pinus massonia), which is reminiscent of ponderosa pine. All three of these species have tremendous potential as timber trees. When we visited the Fuzhou Mountain resort high above the city of Fuzhou, we saw some very ancient planted Cryptomeria cuppressus trees, a relative of the sugi tree that looks more like an evergreen dawn redwood, that were estimated to be about 1,500 years old. There is a temple where tourists leave tokens of honor to the ancient trees. I left an American and a Chinese coin in recognition of the potential of these two great nations working together. This temple and others I saw on the trip were generally timber-framed in a post-and-beam style that made me think of the modern mass timber buildings that are being built in Portland and elsewhere. At the top of the mountain, it was almost like a cloud forest. As we started down the mountain at sunset, we had a birds-eye view of Fuzhou with the lights coming on, and could really see the size of this great city. I felt that future building in these huge and growing modern Chinese cities, using mass timber grown in sustainable forests, might be a huge improvement for our planet. That night, the Fujian provincial government hosted a final dinner for our group. 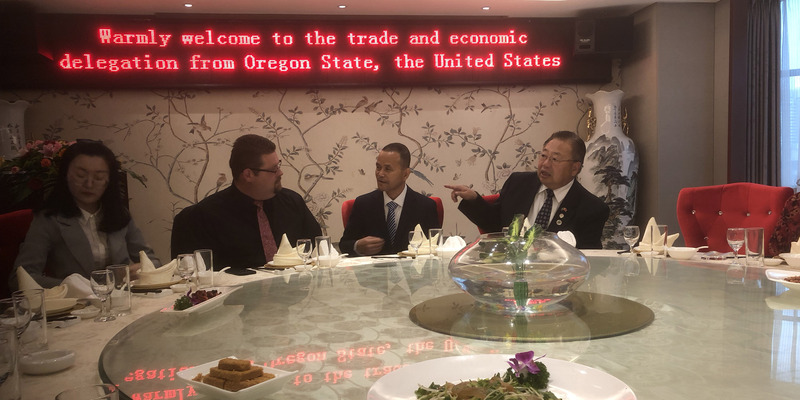 It was a very special dinner, and many speeches and toasts spoke of the 35 years of friendship between Oregon and Fujian, a relationship that was started under the leadership of former Oregon governor Vic Atiyeh. I’m back in Oregon now, and while I’m very glad to get home, I also have a new appreciation of our friends from across the Pacific who build huge cities with giant apartment buildings, have a great respect for trees and love wood. There just has to be a way they could build these buildings out of Oregon mass timber. Is it time for Christmas already? Halloween was last week, and many of us have just finished taking down the decorations, eaten our last “fun-size” treat and (hopefully) put away our costumes. You’ve probably already noticed that all the stores have rolled out their Christmas decorations, and it’s likely you’re thinking this is way too early. But this year, there’s a really good reason for Oregonians to start thinking about Christmas in early November. 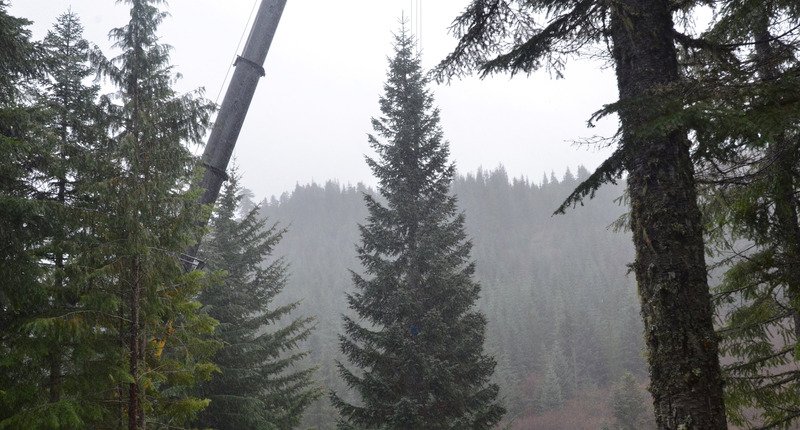 That’s because this year, the U.S. Capitol Christmas Tree comes directly from Oregon’s own Willamette National Forest. This doesn’t happen very often. In fact, the last time the tree came from Oregon was 2002. On Friday, Nov. 2, I attended the tree-cutting ceremony for the 2018 U.S. Capitol Christmas Tree, along with 50 members of the public. The tree, which is an 80-foot noble fir, was selected by a representative from the Architect of the Capitol. You can read about his experience traveling to Oregon to choose the perfect Christmas tree for the Capitol here. The tree was located in the Sweet Home Ranger District, about 8 miles up a winding and scenic gravel Forest Service road at an elevation of 3,500 feet. In typical Oregon fashion for cutting a Christmas tree, the weather was very rainy. 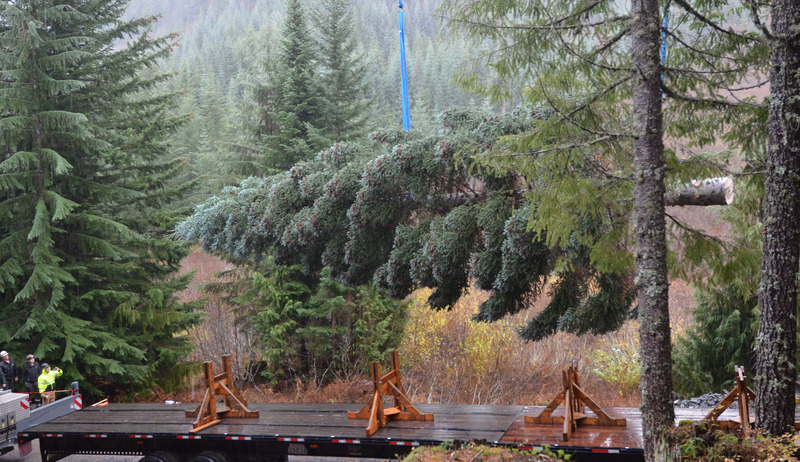 But the conditions didn’t dampen the spirits of those gathered to view the tree-cutting, who cheered loudly when the tree was cut and then carefully hoisted onto a custom-fitted flatbed truck. OFRI is proud to sponsor the U.S. Capitol Tree. In keeping with our mission to advance public understanding of forests, forest management and forest products, we developed an instructional guide for third- and fourth-grade teachers. The guide is designed to help teachers use the U.S. Capitol Christmas Tree as a context for investigating why Oregon is such a great place for growing trees. The U.S. Capitol Tree is called “The People’s Tree,” and it will be displayed on the West Front Lawn of the Capitol. Starting this week in Sweet Home, it will begin a more than 3,000-mile journey across the United States. The theme of this year’s tree is “Find Your Trail,” which recognizes two anniversaries: the 50th anniversary of the National Trails System Act and the 175th commemoration of the Oregon Trail. The tree will follow the reverse path of the Oregon Trail, visiting 25 communities along the way. One of the best ways to keep up to date with the tree’s journey is to follow Sweet Home District Ranger Nikki Swanson’s blog. 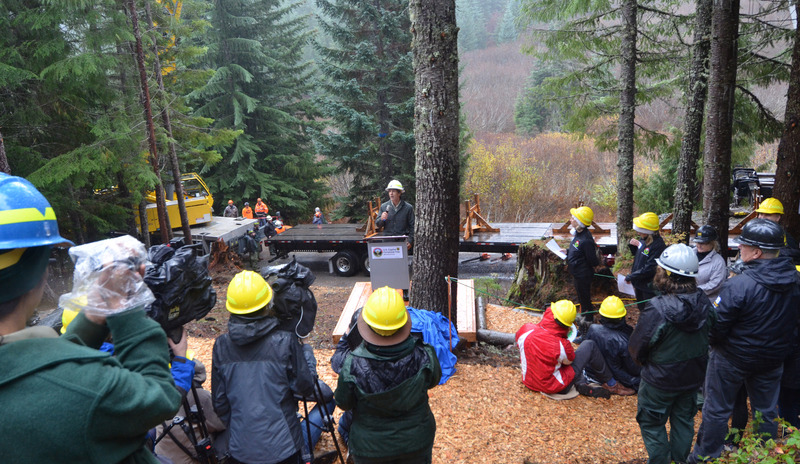 It was fun to be a part of the Capitol Tree’s cutting ceremony, and I’m excited to follow the progress of the tree as it makes its way to D.C.
It’s Forest Products Week, both nationally and here in Oregon. It’s also the week the International Code Council kicks off its public comment hearings on proposed code changes to the International Building Code – which, if approved, would allow mass timber buildings up to 18 stories and 270 feet tall. So, what better time to talk about mass timber, human life safety and fire-performance testing? The International Building Code, which forms the basis for building codes in virtually every jurisdiction in the country, is designed to protect public health, safety and general welfare as they relate to the construction and occupancy of buildings. 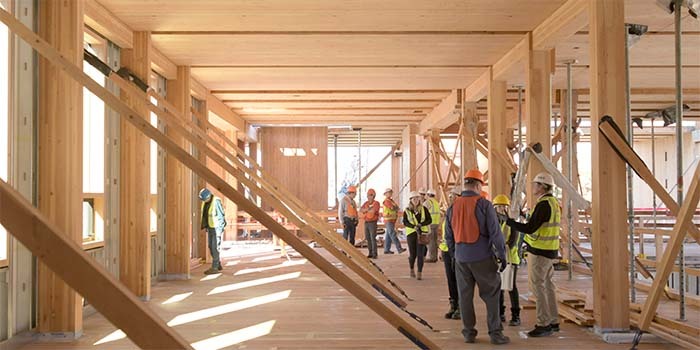 Recognizing the growing interest in using CLT in a wider array of building types, including wood buildings that are taller than current code allows prescriptively, the ICC established an ad hoc committee in 2016 to explore the building science of tall wood buildings and develop proposed code changes for tall wood buildings. Those proposed changes are to be voted on during the current cycle, and they are a subject of discussion at the public comment hearings this week. The committee comprised members of competing building materials industries, including wood, steel and concrete, along with building and fire officials, architects and engineers, and other construction-related stakeholders. The American Wood Council (AWC) has published an online learning course about the committee and its proposals here. In the end, that committee proposed 14 code changes that would create three new building types. Specific provisions can be found here. During initial hearings in April, the ICC overwhelmingly approved those proposed changes, paving the way for this week’s public hearings. It’s important to note that everyone involved in the process takes very seriously the fire safety concerns that many have raised. That’s why a wide range of CLT and other mass timber assemblies have been subjected to significant fire testing, including full-scale fire tests of two-story furnished CLT structures. These tests were conducted by a team of fire experts from the U.S. Bureau of Alcohol, Tobacco, Firearms and Explosives (ATF), alongside scientists from the U.S. Forest Products Laboratory. For decades, fire engineers have understood that even though wood is combustible, the sheer size of mass timber products gives them a degree of fire resistance. When they burn, a char layer is formed that protects the inner portions of large timber from the heat of the fire. It’s the same phenomenon that allows large trees to survive forest fires. Knowing this, engineers often protect steel connectors from fire by encasing them in wood. AWC has a nice summary of mass timber fire testing here, and Think Wood has a much more comprehensive look at wood-related performance testing here. The science on mass timber’s fire safety is comprehensive and unequivocal: The testing shows that wood can and does meet all the fire safety requirements other materials must meet. Mass timber buildings are safe. In recognition of this, Oregon has already taken steps to adopt the ICC ad hoc committee’s changes into the state’s 2019 Structural Code, which will take effect in October 2019. The state has also made the changes effective immediately through adoption of a Statewide Alternate Method. Washington state has legislation in place that embraces mass timber and calls for rapid enactment of code changes. California is not far behind. It’s time for the rest of the country to catch up. Shortly after posting this blog, voting members of the International Code Council voted to approve all 14 proposed code changes put forward by the Tall Wood Ad Hoc Committee. Those changes will now be subject to the ICC’s online voting, the final step in the code change approval process. Read the announcement from AWC.